Where do I use my Vapemate voucher code? 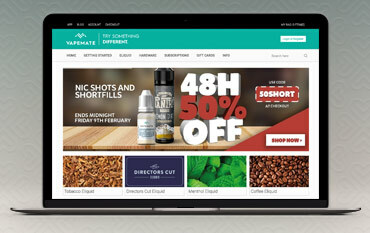 Vapemate offers a huge selection of quality e-cigarettes and e-cig products including e-liquids of numerous flavours and strengths, hardware such as mods and kits, batteries, chargers, coils, atomisers, vape tanks, clearomizers, spares and accessories as well as subscriptions, gift cards and much more. Vapemate offers a handy ‘getting started’ tab which explains all you need to know about how to use e-cigarettes, how they work and what you need to enjoy them fully. Discover what’s in an e-cigarette and why they’re so much healthier than tobacco cigarettes and find all the help and advice you need to quit smoking altogether. There is one huge difference between smoking and vaping that has led to organisations such as Public Health England to claim that it’s 95% safer to ‘vape’ than smoke. Vapour comes from the process of heating whereas traditional smoke comes from the process of burning. Supporters of e-cigarettes argue that the burning is what produces so many of the dangerous chemicals associated with traditional smoking. An electronic cigarette, or e-cigarette, simulates the effects of smoking by converting a liquid, known as e-liquid or e-juice, into vapour. The e-liquid itself is in part nicotine, so you get your nicotine hit in this way – unless you’re vaping only for flavour using a zero-nicotine e-liquid. The vapour is a substitute for the smoke you'd inhale when smoking a traditional cigarette and doesn’t contain any of the harmful chemicals or carbon monoxide. Vapemate produces, high-quality, UK made e-liquid that customers love. They developed their own technology for accurately dispensing large volumes of e-liquid, allowing them to offer a unique range of flavours, blends and nicotine strengths. Due to the growing popularity of their products Vapemate developed their own dispensing technology allowing them to rapidly dispense a custom “made to order” e-liquid product, giving them one of the largest e-liquid offerings on the planet. With flavours, blends and various other options considered, the Vapemate catalogue consists of over 60,000 different product variants with flavours including fruit blast, strawberries and cream, amber blend, cola, tobacco, rhubarb and custard, menthol, mango, peanut butter, plus much more. Give the perfect present to someone looking to make the switch to electronic cigarettes with a Vapemate gift card. If someone you know is looking to quit smoking or likes to ‘vape’ help them take the first step or treat them to a great gift of up to £100. Simply choose your amount, enter your details and your recipient's details and have your gift card sent to you digitally via email. UK orders over £50 will be shipped free of charge via Courier Delivery, courier delivery on orders under £50 is £4.99, £6.99 on a Saturday and £7.99 on a Sunday. You have 7 days from the date you make your payment to cancel your order, however, as Vapemate aim to ship all items within 24 hours you can return the order unopened and in its original condition to receive an account credit or a full refund (customer to pay shipping costs). When returning an item, it is your responsibility to ensure that the correct postage is paid, the goods are correctly packaged and a tracked postal service is used if required. Write: Vapemate Ltd., Unit 9 Childerditch Industrial Park, Childerditch Hall Drive, Brentwood CM13 3HD. Or send Vapemate a message using the contact form. There’s also a live chat feature available on the Vapemate website. Vapemate has worked hard to produce quality e-cigarettes, e-liquids and accessories for vape enthusiasts who are trying to quit smoking. Whether you’re trying to cut down or stop smoking altogether, or you simply like to vape for fun you can find all the products you need at Vapemate to help with the process and make smoking e-cigs more enjoyable! Shop with a Vapemate discount code from us and you could save money on your vaping products too, whether you’re looking for a starter kit, a new flavour e-liquid or handy hardware or subscriptions you can find them all at Vapemate.